As many of you know we are on a short bike tour intermission due to my youngest son’s severe altitude sickness. His health is vastly improved since coming home to San Antonio. Thanks to the care of Dr. Q from Pinnacle Wellness as well as our Health Coach, Penny Muckleroy he is now back to his normal happy-go-lucky self. In the meantime, we had time to download all of the recorded footage of the journey from California to New Mexico. We have been looking forward to sharing some of our adventures with you. So, with a little help from iMovie we were able to create this fun movie trailer. The tour will restart when I rejoin Roger and Susan in Del Rio, TX. With four more states of filming still to come, your support is needed to complete the documentary. Consider donating to see this project completed by clicking on the big blue “Support the Documentary button. Henry L. Parrilla from Bike Seven showed Jordan and I how to replace a bike chain, repair a broken spoke and how to install a new derailer. While we hope we never have to use these repair skills during the bike tour, we sure are glad we know how to make repairs should the need arise. Thank you, Henry for sharing your bike repair knowledge as well as words of wisdom when it comes to long distance bike touring. I went to visit the eye doctor at the insistence of my mother, Nelda Cooling, owner of Koolaches Bakery (and a sponsor of the tour). As many of you know, I have been using over-the-counter reading glasses for a couple of years now. I’ve been in denial about really needing glasses, but I knew it was time to make it official. What I didn’t know was exactly how much I really needed them. I had an “Oh dear!” moment upon hearing that bifocals were in my future. I am now getting the hang of contacts. Putting things in and out of my eyeballs just seems so opposite of what I should be doing. What I will say is that being able to look at my phone without reaching for glasses is a very nice thing. Thanks Mom! The last thing we did this week was to take our Ladybird, who is the Official Bike Tour Mascot, for her annual checkup. At 14 years of age, we wanted to make sure she was fit and ready for two months of travel and adventure. Something we found especially interesting was that she would need travel papers in order for her to legally cross state lines. Turns out that taking a pet outside of state lines without travel papers can be a costly endeavor which can get your pet impounded. Happy to say she is squared away with a rabies shot as well as flea and heart meds. As you can see in her video, she is less than amused. Being poked and prodded does not make for a happy puppy. This will not be the last time you see Ladybird on video. We will also be sharing “Ladybird Approved” dog-friendly locations as part of our bike tour discoveries. When it comes to embarking on a cross-country tour, cycling day in and day out for over 2 months is only part of the story. The real power behind the tour is my support team. My sons, Jonathan and Jordan, will be with me along the entire 8 state ride. I am thankful they’ll be providing cycling support but what is even better is that they will be recording the entire journey for a documentary film. Having them with me on this trek to to film the ride experience and capture interviews of the people we meet adds so much value to the tour and makes it even more meaningful. As part of the team for the bike tour, Jonathan is in charge of filming the documentary. Keeping sponsors, supports, friends and family updated through social media of Jennifer’s progress. Jonathan will also be one of the drivers of the support vehicle across the 8 states from California to Florida. Jordan his thoughts on the bike tour. As a member of the documentary team filming, Jordan will also drive and help Jennifer maintain her fitness through stretching exercise and workouts. To learn more about the bike tour documentary simply go to the Bike Tour Documentary. 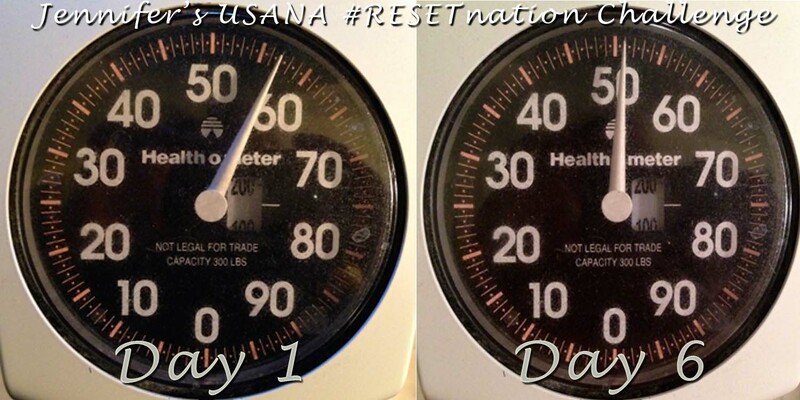 One week ago today, I started the RESET Weight Loss Challenge. As an Independent Distributor for USANA Health Sciences, I wanted to see how this particular product worked. I have been extremely pleased with the results I have seen after taking USANA’s nutritional supplements that I wondered how well their other products performed. Here are the results from my 5 day challenge: -6 lbs. I began the morning of day 1 at 157lbs and wound up at 151lbs on the morning of day 6. The results have made me even more of a believer in the products that have now become a daily part of my family’s lives. If you would like to lose an average of *4 1/2-5lbs over 5 days, contact Jennifer via email or Twitter to join the RESET Weight Loss Challenge. Disclosure: As of 7/31/2014 Jennifer Navarrete became a USANA Health Sciences Independent Distributor. Disclaimer: Always consult a doctor before beginning any weight loss, diet or fitness program. In part three of the Health Assessment, Dr. Ho from Pinnacle Wellness draws some blood and explains what I will learn once the results are back from the lab. Disclosure: Pinnacle Wellness is providing me with services for the health portion of my Health | Fitness | Beauty Quest. I will share my personal experiences of my weekly visits through audio posts and videos which will be posted on the site as well as on the Health|Fitness|Beauty Quest YouTube channel. After my interview with Dr. Ho and Dr. Q, I scheduled a health assessment at Pinnacle Wellness. I completed a double-sided two page form which was unlike any I had ever filled out at a doctor’s office. I knew right then and there this was no ordinary place. I was even more intrigued to learn more about how the Pinnacle Wellness philosophy would impact my journey. When I sat down with Dr. Q, one of the first things he did during my Health Assessment was ask me questions related to my working habits, physical activity, drinking, eating habits and more. The part I found rather interesting was when he asked me about the physical health and happiness during my childhood and teen years. There is a method to their system so I invite you to join me in part 1 of a 3 part Health Assessment Series. In order to get/be/stay healthy I need to know where I am now on the health scale. So, on the recommendation of my good friend and fellow cycling bud, Penny Muckelroy, I sat down with Dr. Ho and Dr. Q from Pinnacle Wellness. I wanted to find out more about their practice philosophy as well as what someone my age (ugh, can’t believe I just wrote that phrase) should be doing when it comes to leading a healthy life. Disclosure: Pinnacle Wellness will be providing me with services for the health portion of my Health | Fitness | Beauty Quest. I will share my personal experiences of my weekly visits through videos which will be posted to here on the site as well as on YouTube.